Ready for more pillow talk? For a picture of my pillow and answers to many personal questions visit yesterday's post. Today it's all about Barb's quilt. Her basket quilt took a layer cake and a bit more from our Antique Fair line with Moda Fabrics. Check the pattern for details. Here's a picture of the full quilt. Sorry for the terrible shot....but we have snow issues here. We had to get the drive shoveled this morning. The picture above shows a closer view. There are 7 rows of blocks. There are 25 basket blocks and 24 red print blocks. Click here for the pattern. And to help you make your own, we have two layer cakes to give away. Leave a comment and I will choose 2 winners. One layer cake for each. Wish we had more layer cakes to give...but Barb cut hers up for the quilt. Don't forget to visit Jan Patek tomorrow! She has some pillow talk to share with you too! This is my daughter's bed. After photographing the basket quilt, I thought I would take these to show too. 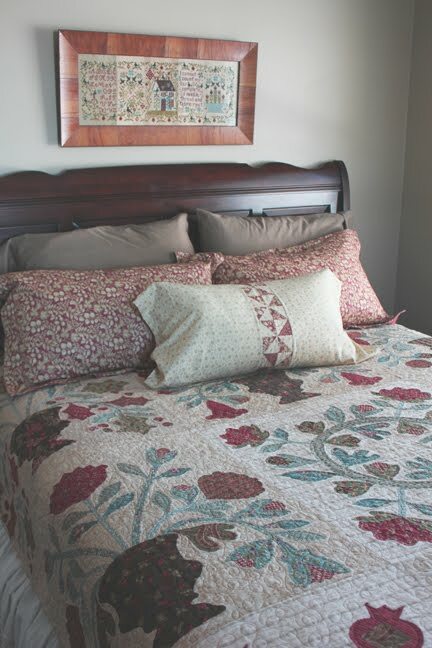 The shams pictured above were made by Jeanne Zyck our quilter. She used one of my favorite prints from Wild Rose. The smaller pillow was made from some left over half-square triangles. The sampler hanging on the wall is the bonus piece from our Loose Feather series. (It's no longer available.) 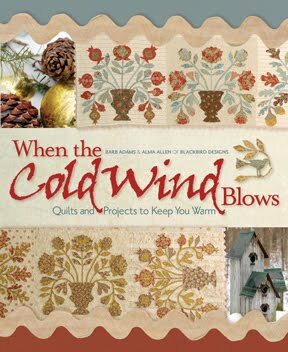 The quilt pattern is in the book, When The Cold Wind Blows published by the Kansas City Star. We had some cold wind blowing here yesterday! Thank you for coming by today! Your visit is always appreciated. Don't forget to leave a comment for a chance to win one of the layer cakes. Drawing ends on Thursday. Will announce the winners Friday morning. That's gorgeous! Another one to add to my list of Blackbird Designs projects I must make. LOVE the colors of your quilt. Thanks for sharing! What a beautiful quilt. It looks perfect to snuggle under with all this snowy weather! I don't know how you keep coming up with these great designs! Love the new fabric line.....but of course I just love red and turquoise! Wonderful handcrafted items! thank you so much for sharing about yourself! That is so beautiful. As always with you designs. Very Nostalgic and reminds me grandma. Thank you for sharing and the warm fuzzy feelings. Absolutely beautiful and your fabric is gorgeous! Hope you are staying warm! Please include me in the drawing. So funny pillows projects! I mean to make some! Sometimes you just need a good idea! I have all of these orphaned blocks that need homes! Off to make pillows! Thanks for the idea! I made the BIG basket quilt from the book but would love to do another one. Thank you for the opportunity to win. The quilt looks great. I love reds and creams. Thanks for the giveaway. Ummm...I think I must move into your daughter's room. I will clean up every day and not be a bother! 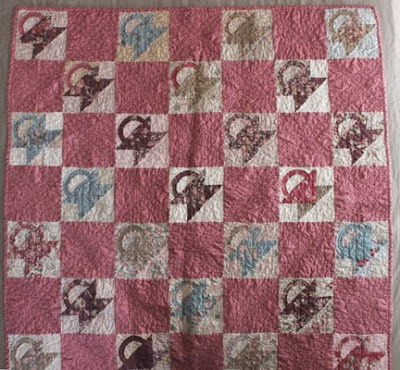 Love the "antique feel" of your quilt! It is perfect for this kind of the year. Of course I would love to make this pattern. I always love coming here. Your quilts are so beautiful. Another 'must make' project! This would make a lovely quilt for a little girl; the colors are perfect for that. The pieced pillow is also a great idea! I always get such good ideas from your pictures. I have several pages in my idea notebook that are simply from your blog. Love the quilts. I am in a romantic quilt mode anyway right now. Maybe thats because Valentine's Day is not far away. Hope I win. Please add my name to your giveaway. I love, love, love this quilt! And thank you for the free pattern. Stay warm! I love the colors of your Antique Fair collection. The basket quilt is beautiful. Thank you for sharing the pattern! And for your great contest. Thanks for the chance. Barbs quilt is sooo beautiful. Love the pink! And your daughter's bedroom is a delight. Your pillow from yesterday's post is fabulous and a great way to recycle a left over block. The stitching is also fabulous. Gives me some great ideas for some of my orphan blocks. This has given me an idea for a quilt I'll be doing in the next couple months. Thanks! Love your latest book, Garden Party! Being a gardener, the blocks are right up my alley. I love basket quilts too, so this one is lovely as well! Absolutely wonderful! 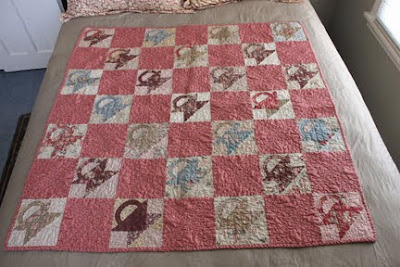 Your daughter is so lucky to have a mother who will make her gorgeous quilts and samplers. What a bed! I hope i win your giveaway. I love the basket quilt! Thank you for the draw, your fabrics (and crosstitch patterns!) are always so beautiful. And your daughter's bed is magnificent! I just love your books and quilts. Thank you for the basket pattern. I love this line of fabric. I am a huge fan of Moda fabrics in general and it is hard to find in our local quilt shops. I can't wait til the Quilt Show in our area later on this month. Coud I please be entered into your drawing. I love your books and patterns. It always makes my heart sing when I see a new one come out. Love the colors and your daughter's bed is beautiful. The basket quilt is adorable. I really love your daughters room! Need to copy that smaller pillow. Your pillow is beautiful, and I agree about using feathers. But a liner is really important!! Just love your style! "Antique" baskets...just so charming!! I always enjoy your blog postings. Thank you both for your wonderful patterns and fabrics! Beautiful! I'm getting ready to make a quilt out of the Garden Club book. Beautiful designs and book. Thanks for the chance to win. It's exciting to join the giveaway. The basketquilt is great. In the Netherlands there was last year (or was it the year for that) a real hype of making a basketquilt. That quilt is awesome! Totally have to add it to my project list. Alma ~ I would LOVE to win your layer cake! the quilt is beautiful! So much inspiration, and such a wonderful quilt! Thank you for the pattern, and for the chance to win some of the great new fabrics. Love that small quilt. The fabric was perfect for it. Love your pillow and the basket quilt. I am really looking forward for your Antique Fair to become available to purchase. It is beautiful!! Thank-you for the quilt pattern. The fabrics are beautiful, as usually. Love the quilt and pillow too! Love the quilt. Would love to win a layer cake, too. Gorgeous quilts! I love the photo of your daughter's room with the Mystery Sampler framed above it! Love the quilt. Thanks for the free pattern. Would love to win a layer cake to start this project. Keep up the good work. Love the basket quilt. Can't wait to get started but I need the layer cake! I really love your fabric line and would love to win that collection. I love your work and have made several things from your patterns. Thank you so much for the lovely pattern and for the chance on your giveaway. I haven't visited your blog before and I must say it's lovely. I think I'm going to have to become a follower! I love your fabric line Antique Fair. I am making Bunnyhill's BOM squirell quilt this year, and I plan to use your fabrics!The fabrics have a true "antique" look and feel. Thanks for sharing in your blog and I can't wait to check out your book "When the Cold Wind Blows". I love applique! Love the Basket quilt! Your pillow was beautiful! I love the way you quilted it. Thanks for sharing. Your photos are so inspirational. As always, LOVE your designs!! I am starting your Birds of a Feather quilt now...would love to win! I've always wanted to tackle a quilt...what better incentive than winning the layer cake (as if your pictures are not enough)!!! I haven't been quilting yet. But I wanna give it a try this year. So thank you for this lovely pattern.....but I think I will start with something easier. I love the basked quilt, thank you so much for the pattern. I want to makethe quilt which is laying on the bed of your daugther and of course I want to make the basketquilt because I like baskets very much. I loooove that quilt! Your daughter's bed looks so nicely dressed, too--and I love the sampler above the bed! 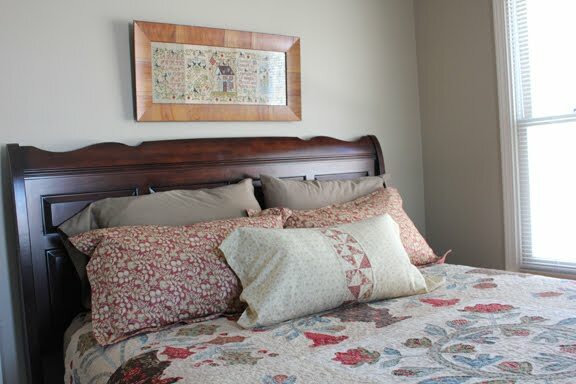 When the cold wind blows, these pillows and quilts certainly keep you comfortable! Love Antique Fair! I love basket quilts! I will be making this one even if I don't win a layer cake, but I will keep my fingers crossed:) Hope you are warming up over there! Such a pretty quilt. It can be a table topper or a cozy couch quilt. I enjoy your patterns very much. Thanks for the charm pack giveaway. I love fantasy reads..the good vs evil type. Stay warm. Beautiful quilts! And what a useful idea for a UFO! Thanks for the chance to win! Love the basket quilt~ And, thanks for the pillow post yesterday. Always good to get that gentle reminder of how to use up those "test" blocks. And as for your daughters bed - beautiful! I love the embroidery you did on your pillow. The quilt is beautiful. Thank you for the chance to win. What a wonderfull basketquilt, thanks for the pattern. I always love your fabrics and the antique fair is already on my list to order, they are just so gorgeous, I can't wait to see your next fabric line. I LOVE the 2671 group in Antique Fair! Hoping hoping to win and that you are only enjoying the blizzard not having to contend with any difficulty! Wow, those are some amazing quilts! Thanks for showing them to us. Your fabric is beautiful and the details in the quilt is amazing. WOW. I love basket quilts, thanks so much for the pattern! I am also snowed in...this is my second day snowed in at home sewing in my pajamas! What a gorgeous quilt! I love your designs, right now I am making your "Ruffle quilt". Thank you for your ideas. Your daughter is lucky to have such a lovely bedroom! It looks very cosy and so neat..... It's wonderful to see shots of your home. Gorgeous quilts! I love basket quilts and your colors are my favorite. Thank you for the free pattern. I hope you're staying warm with all the snow. Oh, what beautiful quilts and pillows. I haven't been able to find shams I like, so I suppose I'd better get to sewing! A sham sounds easy. I haven't pieced a quilt in about 20 years (gasp! ), but I certainly feel motivated. Mmmm, that Antique Fair is gorgeous. Your quilt is very pretty and inspirational. Love the basket quilt and would love to win the layer cake. The basket quilt is great! 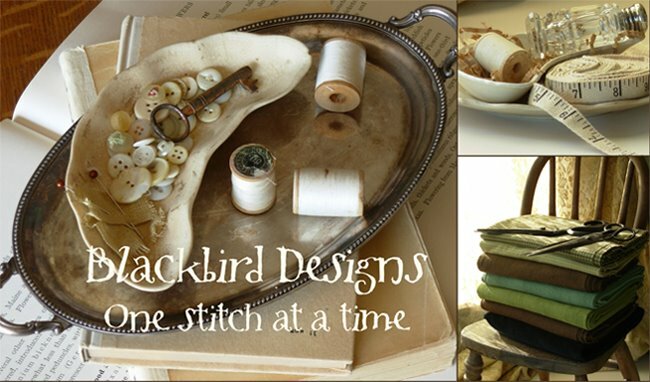 Blackbird Design always has the best things to offer, both in cross stitch and quilts. I will keep my fingers crossed to win the fabric! Both quilts are so gorgeous! I have that book (among many of yours) and will have to pull it out.It's cold and windy here too, for the South anyway. Thanks for the pics and the amazing giveaway! Thank you for sharing your pattern with us! The color choices are lovely. I love the Antique Fair line with its antique colors, lovely. The pillows are great and what a good idea to add texture. I'll be following your blog as you seem to have neat ideas. love the quilt and fabric! I love your designs! I LOVE Kansas City Star pattern books. And the quilt is just beautiful. Congratulations on another stunner. L-O-V-E basket quilts! This one is definitely being added to my 'to do' list. Thanks for the chance to win the layer cake. It would be perfect for the basket quilt! I love basket quilts and your fabric, patterns and books. Would love to win the layer cake! Stay warm! I just love your basket quilt & would LOVE,LOVE, LOVE to have a layer cake to make one of my own. Thanks for all your beautiful designs. I have made several and look forward to making more! I'm a big fan of basket blocks and especially anything "Blackbird Designs"! Please enter me in your drawing for the layer cake. Well that is gorgeous as usuall. Love it and your daughters room. Love the little baskets, thanks for the pattern. Love the quilt, and I love Antique Fair fabric. Thanks for the giveaway. I would love to win one of your layer cakes. I really like the colors in your new fabric line. I am in awe of all the beautiful applique you have done. I've tried some on pillow tops but havem't gotten the gumption to try a big quilt yet. Someday I will though! I love basket quilts -- and this one looks quick and easy. (I just appliqued the first of 291 baskets for your Trick or Treat quilt.) Love the colors in the Antique Fair fabrics! Thank you or the photos - such lovely quilts. Antique Fair is on my list of new Moda fabrics to pick up. I have been waiting to see this quilt since you first had little shot of it in a picture you had at market, I beieve? I love baskets, thanks for the pattern. I love your fabrics and books. Can't wait to see some of your new fabric line!!! I was so anxious to see your post today! I loved the little basket pattern that you gave a sneak peak on the other day... I just couldn't wait to get my hands on it!!! Thank you so much! Pleaes enter me name into the drawing for the layer cake-- Antique Fair is a gorgeous collection! What a wonderful quilt! Your designs are amazing!! Just bought the Garden Club book and these fabrics are a perfect fit. We, too, are digging out from the storm - and the power was only off about 14 hours, so I now have heat again, and can visit the hop! Double WooHoo! I love, love, love the red you chose for Antique Fair. Thanks for the chance. Beautiful quilt ~ the bed looks so comfy with that lovely quilt! The quilt is lovely. Thanks! The quilts are lovely. Thank you for sharing. The quilt is absolutely gorgeous and I'd love a layer cake to create with. Thanks for the opportunity. Love the quilt! Will definitely have to print that one off and make it soon! Love the baskets! Please count me in, for the drawing. Beautiful quilt. Antique fair is such an elegant line of fabric. Amazing quilt! It inspires me! 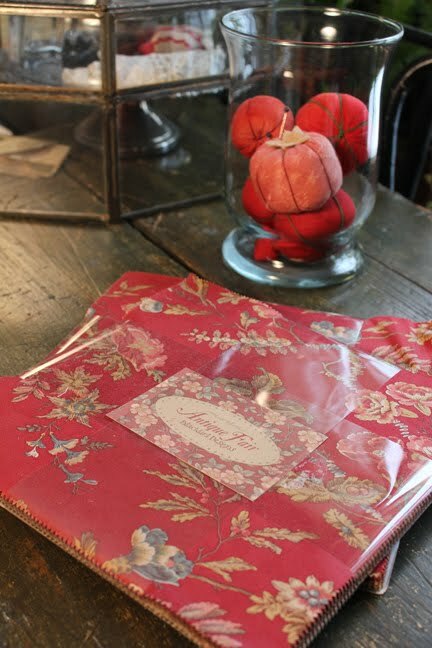 This is a lovely giveaway with beautiful fabric-in the shade of red that I love. 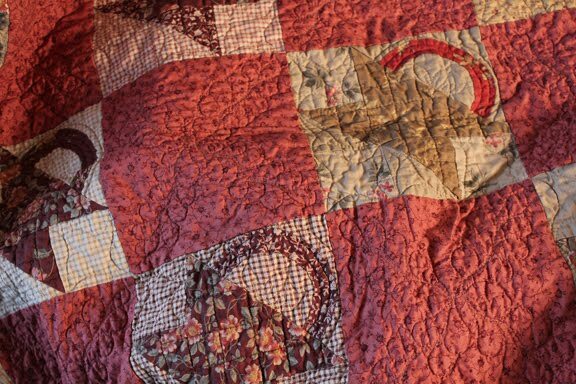 The quilt on the bed is gorgeous, especially to this hand applique quilter. I've said that i wouldn't make any more bed size quilts (I've only made a small number, but also hand quilted them), and I'm doing more patchwork, but your quilt calls my name :). Your fabric choices are lovely, as is your workmanship. So, thanks for this giveaway-I've never bought a layer cake, so winning one would be a treat. This is just such a beautiful quilt. And the pictures of your daughter's bed look so inviting and lovely. If only I could be your daughter....one can dream! Would love to win the Antique Fair fabric. Thanks for the great pattern!!! Baskets have been on my list of to do for awhile. I just love your quilts and x-stitch patterns. I would love to win one of your layer cakes, i just bought a new sewing machine! stay safe & warm, Debby GO PACKERS! Would like to own one of those beautiful layer cakes, love the colors. My first time to your blog...thank you for the pattern and the chance to win! Your basket quilt is delightful. Gorgeous quilts. I love your applique patterns and I'm working on one now for my bed. So beautiful. The new fabrics look yummy too. I love the pattern of the basket quilt, thank you so much! Adorable quilt, and the colors are so comforting. I absolutely LOVE baskets and basket quilts. this should be a fun quilt to make! Thank you for the inspiration an I'd really LOVE to win one of the layer cakes!! Love the quilt - so beautiful! I want to make one too...and also am a fan of your pillow, the extra detailing makes it truly unique! I love the basket quilt - it perfectly captures the look of an antique. Love the colors in the basket quilt. Very period looking. Snow issues here too. I have just started at quilting and found your site. All the quilts and of course the "pillow talk" are sooooo pretty. I am into hand piecing and quilting so I can take the quilt and go anywhere as me and my family travel alot. Choosing one quilt to start with it the hard part. Thanks for having such a lovely blog that is very enjoyable to read. Also for the chance to win some great and beautiful material. You are brave to answer probing questions on your blog. I love that you play piano, go for the squeeze box! Your pillow is an inspiration for me to pull out some orphan applique blocks. Stay warm and safe. Your daughter's quilt is stunning. Would love to work with your new lines, plenty of ideas brewing! Love any kind of basket quilt. I have only made one and that was a wall hanging. Please enter me for your generous give away. I would love to win the layer cake to start my own pillow project. The colors and feel remind me of the fabrics my grandmother used to make quilts from by hand. Absolutely lovely! Beauutiful pictures! We have snow issues here too, in Pennsylvania. Thank you for sharing and let's hope the groundhog is right. Thanks for the giveaway. Lovely fabric line. Your books and patterns always strike my fancy. I would love to win the layer cake! I love basket quilts - I'm making one now. Your daughter's bed is gorgeous! I have been so excited about this new line since I first saw the picture of this quilt after fall market. Thanks so much for the pattern, I can't wait to get started! Would love to have a layer cake! Love your fabric and pattern, love shows in all you do. Alma,,,inspired as usual.....I have recently found my missing bag of stitching projects....now next to the chair for evening stitching....daylite is for quilting! I love your work...please continue!! Antique Fair is wonderful and the basket quilt is perfect. Thank you! The quilt is beautiful! Thank You for giving me a chance to get past being a quilter wanna-be! I have yet to make a basket quilt, and this one is beautiful with the Antique Fair fabric. Thank you for sharing the pattern! Beautiful basket quilt, but then I have a soft spot for all of your fabrics, patterns and books. My mother and I enjoy looking at the books with a good cup of tea. Thanks for sharing! I love the your pillow. What a wonderful use for a test block. I have 2 Blackbird quilts in progress right now...and now I'd like to start on those baskets! Such a beautiful quilt, very romantic. I love the shams too. Doing my happy dance!!!!! (Not a pretty sight to see.) Have been wanting that basket quilt pattern since the photo tease of your market booth. Now I'm counting the days until Antique Fair is available in the stores! Stay warm. Oh, how I love your daughter's bedspread - absolutly beautiful !!! And the shams - so perfect on that gorgeous quilt. Thanks for the quilt pattern. I am looking to purchase your antique fair for Bunny Hills' new BOM Henneritta Whiskers. Thank you so very much for posting the instructions for the basket quilt. I wanted the pattern as soon as I saw the top on yesterdays blog post. I want to make one at least. Wind blew here over night, finally stopped and the sun is shining. Over 14 inches of snow feel overnight. Absolutely love the basket quilt and I would love to win a layer cake. Thanks for the pattern and chance to win. Thanks for the pattern, I love it. Would be wonderful to win the layer cake. I also bought your new book and look forward to making the projects...just love the pillow too. That layer cake looks beautiful...wish we could buy MODA fabrics here, but the shops don't carry them. I love this basket quilt! I loved it when it was posted last year and now the pattern is here. Now to wait for the fabric! Love those colors! Love your basket quilt - it is so inspiring! It was hard to look away. The colors are so warm and inviting. Just got that little cutie patootie printed out and will be starting it soon. Of course, I would love to make it with the new line Antinque Fair, but I do have a layer cake of Wild Rose here, just in case I don't win. It is so sweet!! I love coming here just to repeat reading and gaze at your photos!! Alma, a lovely post. I always look forward to them. Gorgeous and so inspiring. Beautiful colors! Thanks for the chance to enter! That quilt is absolutely beautiful! I love Antique Fair....I just ordered some a few days ago to make a quilt for my sister for her birthday. And I just finished a quilt for a good friend from Garden Party - one of my all-time favorites! Thank you so much for your generous give away, and the opportunity to win some of this gorgeous fabric! Thank you for the lovely basket pattern. I've always wanted to do one. So please enter my name into the draw. I'd love to win some fabric. Thank you for the pattern. Beautiful as always. I enjoyed your earlier pillow post! Thank you for posting the basket pattern, definetly must make this one. The Antique fair line is gorgeous, lovely colours! wow everything on your site looks wonderful. I would love a chance to win - and that book looks great too. What a perfect way to dress up a bed without making a full-sized quilt. The basket quilt is lovely, as are all your designs. I would love to be on the receiving end of one of the layer cakes. I like your pillow. I am getting into applique and this will be fun! I love everything you gals do! The baskets are great - love the colors! This quilt is so beautiful! You are so cute to share the pattern! The Baskets look so Vintage done with these fabrics. I love Baskets. The quilt is lovely. I am taking a break from the snow. We received 20 inches last night, with drifts around 5 feet high. Three hours to get the driveway and sidewalk clear. Thanks for the pattern and the chance to win. Cold Wind blowing here in North Texas also. Perfect weather for starting a new project or two. What an ingenious pattern. The basket quilt block is my all time favorite quilt block. I would be absolutely tickled to death to be a winner of one of the layer cakes to make this, but if not, I already feel like a winner because of the free pattern. Thank you so very much. Best wishes to both of you and try to take some time for yourselves as I know the next few weeks will be bussy getting ready for spring market. Good luck to all your readers too. Such a beautiful quilt. I like the one on your daughter's bed also. Thanks for letting have a peek at your quilts & for the giveaway! What a great, homey design! Looks like you've hit another home run with this pattern. Thank you for doing what you do so beautifully. Thank you for the Pillow Talk and great giveaway. I am a big fan of all of your work. You never disappoint! Am experiencing the snow along with you in Mid-Missouri. Terrible if you need to get out and about -- but it is so pretty out there! I love all of your designs! You two gals are very talented and I would love to win your layer cake so I could give your quilt a try! I love the basket quilt so much that I downloaded a copy! Thank you for the pattern!